As a hart longs for flowing streams, so longs my soul for thee, O God. My soul thirsts for God, for the living God. When shall I come and behold the face of God? “Hide not thy face from me” (Ps. 27:8–9). God is the goal of the inquisitive mind, the will that is eager to love without limits, and the restless heart. The thirst for God is common to all because we were made by God and for Him. The restlessness of the heart, the desire for eternal happiness, for fulfillment, to love and to be loved, is nothing but the thirst for the veiled God. It is a thirst that only He can satisfy. During our earthly exile, we experience both the need for the Almighty and the deprivation of the vision of Him. This makes for suffering. Endowed only with the poor and partial vision of things, we have a nostalgia for the lost Paradise and a deep, intuitive longing for Heaven, where the total vision is to be found. Man was made for that; his entire being pines for that! He was created for Heaven. Hence, in this earthly exile, his deepest vital anguish, his most insatiable thirst can be satisfied only by the discovery, the loving encounter with the now secluded Lover. The psalmist says it clearly: “The Lord is my light and my salvation” (Ps. 27:1). “Hide not thy face from me,” exclaimed King David (Ps. 143:7), and Psalm 89 echoes this anguish: “How long, O Lord? Will thou hide thyself forever?” (v. 46). This article is from a chapter in Why God Hides. The longing for the Lover grows hand in hand with contemplation. Now we see Him under obscure images, for “it does not yet appear what we shall be, but we know that when he appears we shall be like him, for we shall see him as he is” (1 John 3:2). With God’s help, man manages to remove, as it were, bit by bit, the veil covering the shielded Lover. In so doing, he experiences great joy and consolation. This is not surprising, for the Creator made man for the light, not for darkness. They make their own this saying of St. Paul: “For He is our peace, He has made us both one, and has broken down the dividing wall of hostility” (Eph. 2:14). Lukewarm persons feel annoyed by the present situation. In their inability to see the Lord and the other persons of the supernatural world, they seek an excuse for their lack of faith. They ask: “Where is God? Where can He be found? Is He hiding somewhere?” They argue that they could be vibrant and dedicated to the Ultimate Being, were He not so remote and concealed. The cause of the deepest longing that man has — this vital anguish — is the need for God. This need is coupled with the fact that He is outside of man’s sense perception. Since He is a Spirit without any matter, He cannot be seen. But the Almighty looks at man with infinite care and love. As the inspired psalmist sang: “The Lord looks down from heaven, he sees all the sons of men; from where he sits enthroned he looks forth on all the inhabitants of the earth, he who fashions the hearts of them all, and observes all their deeds” (Ps. 33:13–15). In both cases there is desire, even impatience, to see the Lord, but only in the second instance is the motive a good one, for it is prompted by faith, hope, and love. The desire to know the future with certitude is universal. It includes eagerness to unveil the mystery of life. It shows itself in a longing to penetrate the divide that separates not only today from tomorrow but also this temporal world from the next, the human from the divine. Superstitious beliefs such as the horoscope are related to this desire. In the last moments of a dying person, when someone — a doctor or a nurse — says, “He or she is gone!” it is likely that a question comes to mind: “Gone? But, where?” In those moments, the reality of the gulf, the partition that separates this world from the next, is keenly felt; and death appears as a jump from this world to the other world behind the partition. If the desire to see the concealed Father is universal, scholars devoted to the study of the things of God — theologians — could be expected to experience this yearning in a special manner. Along these lines, Benedict XVI said: “For me, theology is the attempt to get to know the Beloved better.” In the pope’s mind, theologians are to undertake not just a cold, scientific research concerning the Supreme Being but a loving search for the shielded Lover. The saint of Avila had dealt with the Divine Lover for many years through the veil that separated her from Him. She had eagerly waited for the moment in which the veil would be removed and the view would no longer be obstructed. In dealings with persons of the supernatural world, there are two main characteristics. One is the discomfort due to not being able to see face-to-face the person one is talking to. The second comes in handy: the certainty that the interlocutor is truly there, a certainty based on faith. These two combined give rise to a semi-light, a chiaroscuro, a state of affairs that may be called “seeing in the midst of shadows.” It is the vision characteristic of the journey on earth that, while illumined by faith and reason, strikes a sharp contrast with both the perfect light of Heaven and the total darkness of Hell. This uncomfortable condition creates a yearning for the Beatific Vision in the Eternal Day, as well as a dread of the perpetual Night of Hell. The search for the Living Lord is a very personal endeavor. It is a task assigned to each person individually and in a nontransferable way. Each one has to engage in this search. And yet, thanks to the sterling Communion of Saints, it is an accompanied affair. The Triune God is the most interested; He is the one who decreed this present exile that will determine man’s future status in eternal life. The Lord always helps in the search and in the finding. God the Father has the interest of an infinitely loving Father for the well-being of His children. God the Son has the interest of a Redeemer who wants to see the fruits of His costly Redemption. God the Holy Spirit is witnessing man’s free response to His unceasing work of sanctification. The Blessed Mother, Mary, follows the pilgrim steps of her children too, as no other mother would do on earth. Joseph does the same as the Virgin does, as do the angels and the souls in Purgatory, to the extent that God gives them power to do so. The entire Church on earth also provides continuous assistance, sending (as St. Josemaría was fond of saying) arterial blood, which provides oxygen to the cells. This is done mostly in the form of anonymous prayers and sacrifices coming from countless fellowmen. There is also the guidance of the legitimate shepherds, the pope, the bishops, and priests, as well as the edifying and warm encouragement provided by brothers and sisters in the Faith, most especially relatives and friends. Therefore, it is not a lonely search. Because he communes with God’s family in the company of witnesses, the Christian’s call has a wonderful ecclesial and social dimension. 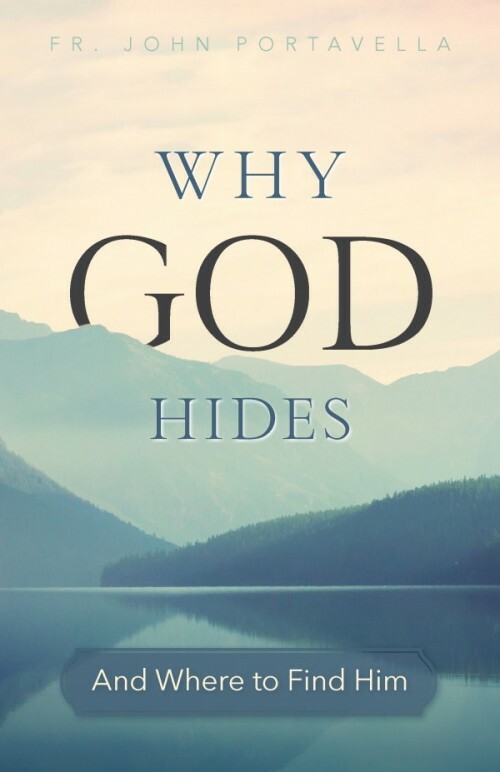 Editor’s note: This article is adapted from a chapter in Why God Hides, which is available from Sophia Institute Press. Fr. John Portavella earned a doctorate in Canon Law from the University of Santo Tomas (the Angelicum) in Rome. He was ordained in 1959 for the Opus Dei Prelature. He is currently doing pastoral work at the University of Asia and the Pacific in Pasig City, Metro Manila.